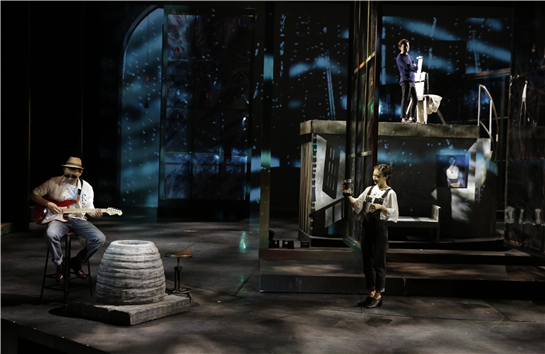 Wuzhen International Theatre Festival. October 13 to 22, 2016, its fourth year. A total of seventy-nine performances by twenty-two invited productions, half from Europe, at thirteen theater spaces; new play competition with prizes; ongoing outdoor carnival; two exhibitions, five forums, six public dialogues, five workshops. 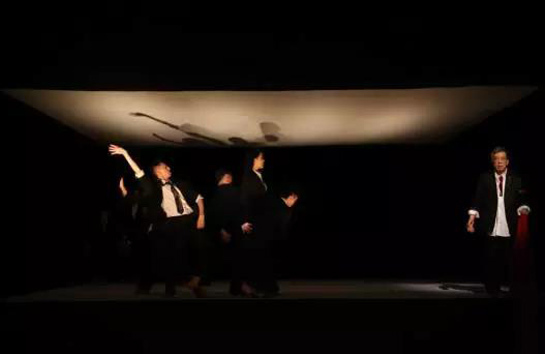 The stellar success of the Wuzhen International Theatre Festival in China has so many interconnected components to it that it is not easy to talk separately about the shows. In the first place, the ancient, canal setting for the festival is so lovely that it is possible to come away happy with not much more than a camera full of picture-perfect photos, or an imagination overflowing with nascent poems on the subject of Wuzhen’s beauty. 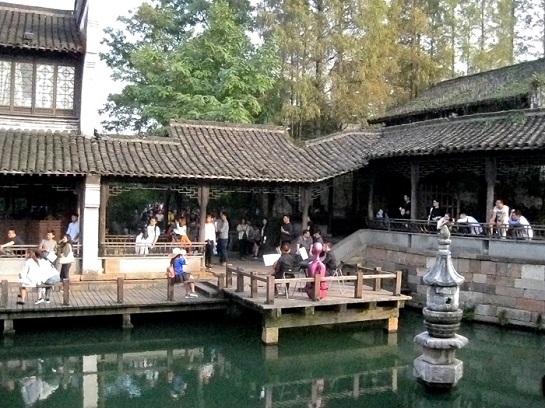 Then, too, for the ten days of the Festival, every inch of Wuzhen becomes a performance space; every café, banquet and ceremony becomes a chance for everyone to talk with everyone, across cultures, about theatre. It is also a factor that the town’s romantic cobblestone alleyways swarm with legends of the theatre, and mega-stars of film and television. Visitors to Wuzhen’s Festival encounter performances of every kind, in every nook and cranny. For breadth, in addition to the productions offered, the Festival holds a rigorous, career-making, new-play competition for productions by teams of next-generation theatre people; creates opportunities for hundreds of outdoor performers from around the world; and hosts both local and international workshops. 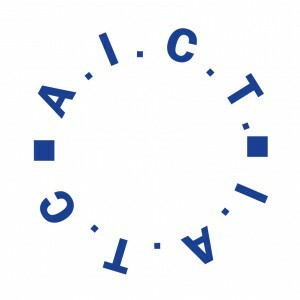 In 2016, the Festival added various exhibitions, including one for stage design, and a forum for exchange between several Chinese and IATC critics. “Forums” encouraged future Chinese cooperation with sixteen artistic directors from Central and Eastern Europe, and with cultural representatives of seven Arab nations. There is no theatre festival in the world doing more for East-West relations than the Wuzhen International Theatre Festival. 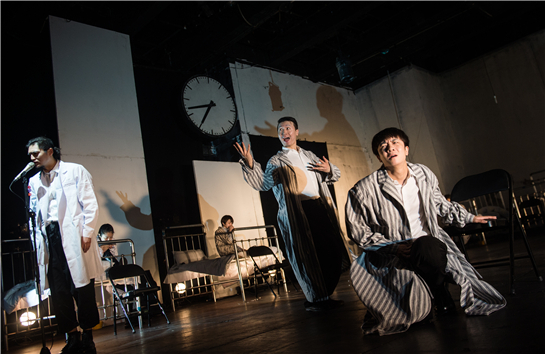 At a time when so much of the world is in political upheaval, Wuzhen works to create relationships between theatre artists and thinkers, including some who have had little contact for any number of logistical or historically complex reasons. The Festival invites professional productions from within China, from the greater Chinese-speaking world and the greater Asian region, and from throughout Europe. Indeed, the venerable town of Wuzhen, in Zhejiang Province on the coast of the East China Sea, is the place to see a superb selection of the world’s festival offerings, including China’s own cutting edge productions. Doctor Godot or Six People Searching for the 18th Camel, based on the book by Dietrich Schwanitz. The satirical pen of German scholar-writer Dietrich Schwanitz (d. 2004) lambasted academia and achieved bestseller success. This combination of scholarship and pop appeal was at the fore in this stage adaptation, which features a politics-and-art debate between Shaw, Pirandello, Brecht, Ionesco and Beckett, in a California madhouse. 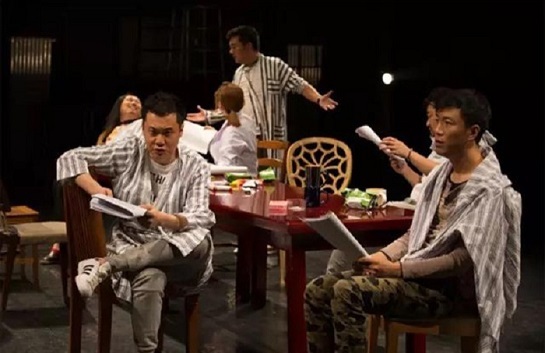 Illustrious director Lin Zhaohua—now eighty, inextricable for decades from China’s forward-guard theatre landscape—has added the idea that we are watching a table rehearsal of an upcoming production of the play. The actors, holding their scripts, mugged and joked while speeding through the dense arguments made by the playwrights, never straying far from embarrassed apology for how challenging the material was. Everyone did a fine job, but the production never rose above their apparent lack of faith in the play text. Big D, inspired by Friedrich Dürrenmatt’s Romulus der Große. The first big success of the Swiss Friedrich Dürrenmatt (d. 1990) was his philosophical-satirical post-World War Two play, Romulus der Große (Romulus the Great), a view onto the day (or so) the Roman Empire died in the fifth century, and the Emperor stayed home to tend his chickens. This production, by actor-director Chen Minghao—an important fixture of the Beijing stage—explores the pull between those who fight in the name of “patriotism,” and those who adopt a purposeful “actionlessness” that faces, Chen says, “the fact that the present will eventually turn into history.” We entered on a staircase, passing through a bevy of chorus members who, dressed in clear plastic and backlit to striking effect, were performing ethereal movements. The large banquet hall below was now a performance space with raised playing areas at right and left. And that is where the mad, mad, mad world of the play came blazing into unforgettable life: the chorus that morphed into chickens, or groupies, or lots of other things, in the spaces between or around stages; the chairs scattered around for audience members who could bear to sit in this electric, Studio 54 atmosphere. Romulus, played by the blazingly talented Zhang Luyi with the speaking voice of a god, sat akimbo on a throne-like throne—a mixture of Christ, Jagger, Richard III, and maybe a used-shoe salesman—surrounded by piles of miscellaneous and hilarious objects suggesting the detritus of a civilization gone to seed: old toys, a folding pet gate, ad infinitum. Chen Minghao was the German Invader on the other stage. Power oscillated between the two leaders like a current, invisible but inevitable. On a small video screen, endless political platitudes scrolled by: We must defend ourselves against the enemy; Economic growth is necessary for national stability. At the end, Romulus hung poised on the top half of a hydraulic ladder as it rose into the air—a perfectly calibrated climax to a text handled overall by director Chen like a prizewinning racecar driver on a dare. Then, the two powerbrokers sat down and had a quiet cigarette together in their bathrobes. Even if there was not actually confetti to celebrate this show, it felt as if there were anyway. Director Dou is an award-winning stage designer who has become interested in how the various departments of a theatre, with their differing concerns, might work together. In his public Dialogue, Dou posited that he did not need to know Shakespeare’s Lear, as long as he gave audiences a good show. His set was like an enormous square marshmallow cut in half horizontally, with the action mostly taking place between the two halves, which sometimes shifted position. Lear delivered long soliloquys: he deserved the hatred of Regan and Goneril because he had been a terrible father. Memorable: there was a battle scene rendered with a chorus of marching soldiers circling the stage with large-ish computer screens strapped to their backs, playing footage of classical battle scenes. Director Meng Jinghui is not just a director; he is a force of nature. It is hard to overstate his achievement and influence in China’s expanding theatre scene, with his quiet erudition, wild eclecticism, bad-boy stance and deadpan, mischievous sense of humor. With fortuitous social forces emerging, in cahoots with awe-inspiring collaborators, Meng virtually dragged the Chinese theatre into the contemporary age through his deep, auteur relationship with the canon of the early European avant-garde. The work of Dario Fo (d. 2016) in particular has served as an important touchstone for Meng for decades, and Fo became in large part the lens through which Meng looked at the possibilities for a new Chinese theatre: Fo’s hyper-theatricality, his irreverence and skewering social critique, his mixing of high tone and lowbrow antics. Here, Meng has turned Fo’s play into a singing, dancing extravaganza with a chorus of inhabitants in a madhouse in a society where of course the state steals: Brecht meets popular farce meets shiny popular entertainment and achieves a stylish, comic desperation. Fulfilling his long conversation with Fo’s work, Meng has once again forged his impossible, signature unity between the commercial and the blasted aesthetic of the experimental. 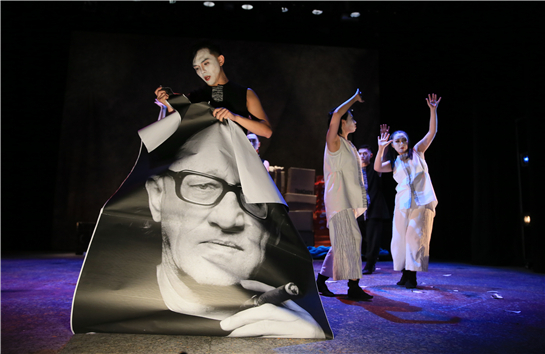 One Hong Kong critic wrote that Alice Theatre Laboratory is “the only theatre company in Hong Kong that persists in their efforts to produce avant-garde works.” Indeed, their production of Müller’s famously abstract text sat squarely, heroically, deliciously in the avant-garde tradition. In lieu of a “play,” the incomparable Müller (d. 1995) offers a poetic, nightmarish text in five parts, with specifics of staging so minimal that no single interpretation or production is possible. Hamlet’s spooky grief becomes superimposed on the Hungarian Revolution; Ophelia becomes Electra in a wheelchair under the sea. All Time seems simultaneous; all people seem to intersect. This production found just the right balance between staging the challenging text and using it as a springboard for their own imaginings: now a formalistic rite; now a ballet dance accompanied by the fluttering sound of book pages used to horribly beat a young woman; now a wall constructed of colorful commercial products. In both Müller’s work and this company’s, by hook or by crook, Hamlet’s experience of Machine emerges. As introduction, readers will find my 2010 Critical Stages interview with Stan Lai here, and my Critical Stages review of his 2016 opera here. This show was mind-bending by stealth. At the outset, we were apparently watching a mainstream TV sitcom: the behind-the-scenes life of a successful motivational speaker. This impression was reinforced by the fact that the lead was played by He Jiong, real-life TV host, so successful he already had over eighty-three million internet followers a year ago. His character, He Shi, taught Happyology to, well, losers. As He Shi started to doubt his own seminars, he suddenly learned he had inherited a ramshackle beach house, and things started to get strange. No simple plot twist, this was more like a slow, sneaky, plot tesseract. Director Lai himself called the play “a screwball Zen comedy” (spoiler alert keyword: reincarnation. . .). He Shi had to decide whether to keep or sell the dilapidated property, so antithetical to the upscale life; we got lost in Time as it folded back on itself, taking some of the characters along with it; his decision process became a metaphor for the choice between materialistic and spiritual values. And when he made his choice for meaningful happiness over Happyology, he took us right along with him. Standout cameo: the perky real estate agent from hell. To see the full Festival program, go to http://www.wuzhenfestival.com/en/index.aspx. 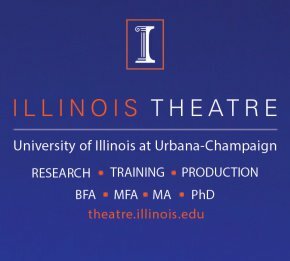 *Lissa Tyler Renaud (M.A Directing; Ph.D. Theatre History/Criticism) is director of InterArts Training, based in Oakland, California. 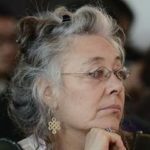 She has taught, lectured and published widely on acting, directing, voice, body alignment, dramatic theory and the early European avant-garde throughout the U.S., at major theatre institutions of Asia, and in England, Mexico, Russia and Sweden. Recipient of Ford Foundation and National Science Council grants, she is also an award-winning actress, a director and popular recitalist. Book publications include The Politics of American Actor Training (Routledge 2009/2011) and an invited chapter in the Routledge Companion to Stanislavsky (2013). Renaud was founding editor (English) of Critical Stages (2007-14), and remains a contributing editor and board member. She is senior editor for the Wuzhen Theatre Festival, China, and a longtime senior writer for Scene4 international cultural magazine.